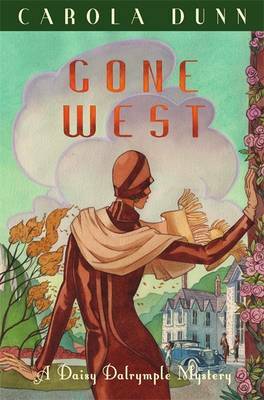 It is September 1926 and Daisy Dalrymple is contacted by a former acquaintance from her old boarding school. Sybil Sutherby was in the year senior to Daisy but has heard of Daisy's adventures as a sort of unofficial detective, from the magazines she wrote for. Sybil has written to Daisy to say she was worried about her employer's health. Daisy, after some soul searching has agreed to journey to Eyrie Farm, a large estate, near Matlock, in the Derbyshire Dales. Sybil explains to Daisy that as she had lost her husband in the Great War and having her young child's education to pay for, she had looked for work as a stenographer and had obtained a live-in position in 1919, as secretary to author Humphrey Birtwhistle, who writes western novels under the pseudonym 'Eli Hawke'. Humphrey had lived for many years in the Wild West as a young man, returning to England to claim his part of the farm inherited from his late father. His brother Norman and sister Lorna also lived there and there was some resentment, that after so many years abroad, he had returned. Not only had he returned, but he had brought with him an American wife, Ruby, to live at the farm also. There were also a number of other guests staying at the farm enjoying his hospitality, together with several servants. The finances of the farm were so limited that if Humphrey had not been a successful author writing three novels a year to his adoring public, no one would have survived without this additional income. Sybil after working for some seven years in the job was a big asset, as she transcribed the manuscripts from Humphrey's barely legible handwritten notes. Then Humphrey had started to get ill, very frequently and seemed barely able to stay awake. Humphrey's publishers were still pushing him for their three manuscripts a year and so Sybil had been creating them from her own imagination, but using the "Eli Hawke" byline and style and characters; sales of the books even improving. Then unfortunately Humphrey dies in mysterious circumstances and the husband of Daisy, Scotland Yard Chief Inspector Alec Fletcher, is sent down from London to investigate. Daisy is stuck in a house full of suspects and with a mysterious death to untangle. This very gripping story rushes on to its startling conclusion. This story could be pigeon-holed as a 'cosy' or a 'Country House' mystery, perhaps similar to many others written by authors such as Dorothy L Sayers, Agatha Christie or even the stories by P G Wodehouse. The author who is English born but based in Oregon, USA, has done her research (listing her substantial resources) and the story has lots of evocative touches of the English world of 1926. I found it particularly engaging. The cast of characters is very large but the author has written such detailed pen-portraits of them that I was never confused. This is her twentieth mystery story featuring Daisy Dalrymple, but my first and I enjoyed very much. Recommended.